Bannock is a form of flat bread, the same thickness as a scone cooked on a griddle or fried in a pan. Today it may also be baked in an oven. Originally made of oatmeal, it takes the form of a large oatcake. Many variations exist, both in Scotland from where it originates and in other countries. Particularly well-known is the Selkirk bannock, which is more like a fruitcake. The different varieties of bannock have historical religious and cultural connections, as do many food products. Today, however, it is most often simply enjoyed. Adopted into Native American culture, the bannock has become popular as frybread, or Indian tacos, particularly at pow-wows and state fairs. In the United States and Canada, bannock is also popular as survival food, a staple for those who enjoy wilderness adventures. The ease of preparation, ability to combine with whatever other foods are available, and delicious aroma when cooking make the bannock a source of pleasure as well as nourishment. Bannock is basically simple to make; it is just bread dough, fried or cooked on a griddle. The result is a flat bread, similar to a large oatcake. The most authentic version is a round or oval piece of unleavened dough, cooked on a griddle. The middle will rise or puff up a little. The ingredients are mixed and kneaded. Then the dough is formed into small cakes and dusted lightly with flour. The cakes are then fried in a greased frying pan, which is shaken to prevent sticking. They are turned when a bottom crust has formed. The bannock, from the Gaelic bhannag, bannach, or bonnach, is a flat, sometimes unleavened bread that originated in Scotland. Although commonly made of oats, bannocks can be made from barley, ground dried peas, wheat, or a combination of grains. In the west of Scotland, bannock has continued to be made with oats, and there can be little distinction between bannock and oatcakes. Historically, the Scots cooked bannock on a griddle called a "bannock stone" (clach bhannag in Gaelic), which was a flattened piece of sandstone. This was put on the ground in front of the fire to heat up, and then used for cooking in the days before ovens were available. Bannocks were originally made without any leavening. Later, yeast was used and starter dough from the previous batch was used. By the early nineteenth century, baking soda with an acid added (such as found in buttermilk) was used, and later baking powder became a common leavening agent. Bannock was brought to North America by Scottish explorers and traders. Indigenous people particularly Métis in western Canada and the northern Great Plains in the United States, adopted bannock in their own cuisine over the eighteenth and nineteenth centuries, most likely after encounters with Scottish fur traders. As a result, even today many Métis and aboriginal western Canadians routinely prepare this dish. In western Canada, bannock is more closely associated with native and Métis culture than with its Scottish roots. Today in the United States bannock is popular as a staple food for wilderness activities. Bannock is a simple but fine tasting bread that can be eaten alone for breakfast or as the basis for a full meal when served with fruits, vegetables, fish, or meat. A source of carbohydrates that is easy to make on the trail it neatly complements high protein trail foods like pemmican. Bannock is a fulfilling meal that can be used to supplement natural foods foraged from the surroundings. It has been a staple food of wilderness explorers, trappers, and prospectors for centuries. Special bannocks, such as Selkirk bannock, are enjoyed on special occasions as a dessert or snack. 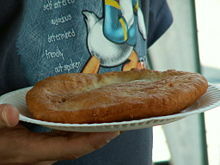 "Frybread," the contemporary Native American adaptation of bannock, is a popular attraction at pow-wows and fairs. In Scotland, four main variations of bannock were historically tied to the druidic divisions of the year: Imbolc (February 1st), Beltane (May 1st), Lammas (August 1st), and Samhain (October 31st). Thus, special bannocks were made for each of these celebrations. As Christianity took over, bannocks also became assimilated. The Lammas bannock became the Marymas bannock in honor of the Virgin Mary and the Selkirk bannock became a popular Christmas treat. In North America, the bannock is associated with Native American culture, and also with survival foods. A staple of wilderness explorers, when cooked over an open fire bannock brings forth images of bygone days. There are many, many different recipes for bannock. They vary by flour or meal used, by whether leavened or unleavened, by special ingredients added, by method of cooking, and by the festival or ritual that it is used for. 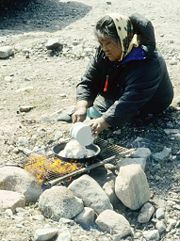 Inuit women preparing to make bannock. Bannock was traditionally made by Inuit while trapping or living in camps. The dough could be wrapped around a stick and cooked over an open fire. Bannock was also cooked in pioneer days over open fires. One of the earliest quick breads, bannock was as simple as flour, salt, a bit of fat (often bacon grease) and water. In gold rush days, dough was mixed right in the prospector's flour bag and cooked in a frypan over an open fire (Ferguson and Fraser 1992). Métis bannock is generally prepared with white or whole wheat flour, baking powder, and water, which are combined and kneaded (possibly with spices, dried fruits, or other flavoring agents added) then fried in rendered fat, vegetable oil, or shortening. Today's Native American "fried bread" is like bannock but cooked in a skillet. However, for the purist, a bannock is not this "frybread" confection that pleases the pow-wow crowds, but rather the simple bread baked over an open fire. Without the luxury of many utensils or ingredients, bannock was cooked in a pan or wrapped around a stick. For many, this is still the true bannock. Variations in flours and the addition of dried or fresh fruit make this bread the simple choice of Canadian campers even today. Irish bannock is a Northern Irish dish, brought over by the Scots who settled there in the seventeenth century. It is a tasty loaf similar to a scone, and is eaten for breakfast or as a snack with tea or coffee. It generally contains sultanas or currants, similar to the Selkirk bannock, although it is made with buttermilk. Originating in Scotland, the bannock has many varieties and uses around the country. Bannocks were traditionally prepared as part of the various celebrations held throughout the year. In parts of Scotland, the Beltane bannock is still a popular custom. It is said that eating one on Beltane morning, guarantees abundance for one's crops and livestock. Traditionally, this bannock is made with animal fat (such as bacon grease), and it is placed in a pile of embers, on top of a stone, to cook in the fire. Once it has become blackened on both sides, it can be removed, and eaten with a blend of eggs and milk. The most famous of all bannocks is the Selkirk Bannock. The first such bannock is said to have been made by a Robbie Douglas who opened his shop in Selkirk in 1859. When Queen Victoria visited Sir Walter Scott's granddaughter at Abbotsford she is said to have refused all else with her tea save a slice of the cake - ensuring that the bannock's reputation was enshrined forever. Robbert Burns also mentioned the bannock in his Epistle to James Tennant of Glenconner, in reference to Alexander Tennant. The Selkirk bannock is unlike the traditional oatcake bannock, being more of a fruitcake. It is made with wheat flour, butter, and many sultanas: in fact, the sultanas should make up almost half as much in weight or volume as flour. Some versions add candied peel as well. The bannock has a flat bottom and rounded top, and is glazed with milk and sugar. It was initially only made for festive occasions such as Christmas. In the United States, nineteenth century cookbooks give recipes for bannock made from cornmeal, or "Indian meal" as they called it (Michigan Historical Reprint Series 2006). Variations could be made, such as a sweet version with molasses, or the addition of a little stewed pumpkin. Today, American bannock is popular with hikers and canoeists. It is usually cooked over an open campfire for consumption during wilderness adventures. It can be cooked in a pan, on top of a heated rock, or wrapped around a stick. A premix of flour, baking soda, and any assortment of dried fruits and oatmeal can easily be carried in plastic bags for the preparation of bannocks. Various Native American nations have developed regional variations of the bannock for which they are well known. For example, the Chippewa had two versions, one with wheat flour usually made unsweetened, and the other with cornmeal and sweetened with honey or maple syrup. Others made bannocks with a paste of boiled seeds. Fried bread, also spelled frybread, is a Native American adaptation of bannock, found throughout the United States. (It is also known as "squaw bread" in some areas.) 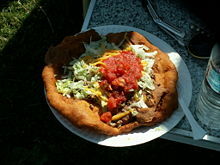 Topped with additions such as beans, ground beef, or shredded cheese, frybread is served as Indian tacos or Navajo tacos. If sweetened, or served with sweet toppings such as honey or powdered sugar, frybread is very similar to the confection simply known as fried dough. Frybread has a significant (if perhaps stereotyped) role in Native American culture. It is often served both at home and at gatherings like pow-wows and state fairs. Frybread was named the official "state bread" of South Dakota in 2005. Also in 2005, frybread became the center of a controversy involving its role in obesity and diabetes among Native Americans (Wagner 2005). NetState.com. Official State Foods. Retrieved June 20, 2008. Ripp, Bart. Food for the Spirit. Tacoma News Tribune. Retrieved June 20, 2008. The Great Spirit Circle Trail. 2005. Bannock Making – Manitoulin Style. Sudbury Star. Retrieved June 18, 2008. Wagner, Angie. 2005. Icon or hazard? The great debate over fry bread. MSNBC. Retrieved June 20, 2008. This page was last modified on 11 May 2016, at 14:38.